At the 1997 Survivor Series, the world was shocked when Vince McMahon screwed Bret Hart out of the WWF Championship. Shawn Michaels won the title and fans were not shy about voicing their displeasure. This came at a time that the Heartbreak Kid was also engaged in a memorable feud with The Undertaker. 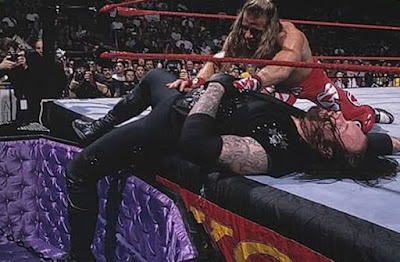 HBK had cost Undertaker the championship at SummerSlam '97. The two clashed in the first ever Hell in a Cell two months later and we met the Undertaker's estranged brother Kane. After the Montreal Screwjob, it was time for Michaels to face the Undertaker once again. The Royal Rumble was the place and this time it was in a casket match. Historically speaking, the Rumble hasn't always been kind to 'Taker. He "died" in a casket match against Yokozuna at the 1994 event. Vader pinned him in pretty quick fashion at the '97 Rumble and this particular title match wasn't going to go for The Dead Man either. In 1998, the Royal Rumble match was on before the championship match. "Stone Cold" Steve Austin beat 29 other Superstars (if you count all three faces of Foley) prior to Shawn and Undertaker doing battle. In the closing moments, both men ended up in the casket, and as Shawn tried to escape, he was pulled back in. They battled back out and brawled until Taker tombstoned HBK back into the casket. But Chyna knocked out the ref and a handful of heels attacked Undertaker until the lights went out. Kane's music hit and the thought was he was going to save his big brother as the two had reconciled their differences. But Kane clocked Taker and assaulted him before he and Shawn closed the challenger into the casket. 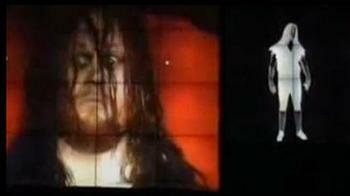 Paul Bearer and Kane locked the casket up and rolled it to the ramp before Kane took an ax to the wooden box. He then doused it in gasoline and set it on fire. The blazing casket and a frantic commentary team closed the show. Despite having major back issues at the time, HBK put on one helluva match that night. 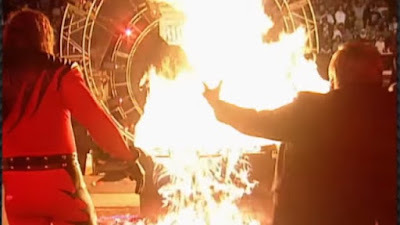 It was the precursor for the epic feud between Kane and the Undertaker and set up the official torch passing from Shawn to Stone Cold and a new era of wrestling ensued.